STAY IN OUR CABANAS TAVIRA ALGARVE APARTMENTS VISIT THE DOLPHINS..SWIM WITH DOLPHINS!The booking office is just 1 minutes walk from the apartments.Plus you can book lots more activities and tours.Like trips to Lisbon,Seville and Morocco,and loads more activities.It does not get anymore conveniet than that! Without doubt this is world class entertainment and is something that should be on everyones to do list if humanly possible.It is one of those days out to rank alongside any entertainment park anywhere. The Dolphins program is a feast for all the senses,demonstrating their inteligence and remarkable relationships wit their keepers and trainers. 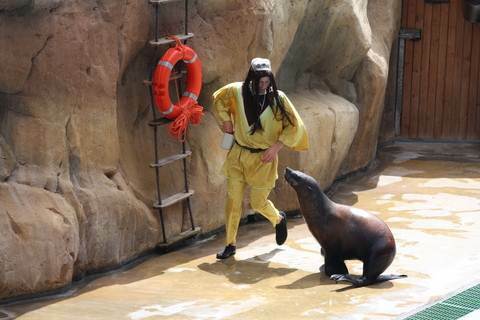 Next in the park you visit Wonderful world Forest.This is the seals and sealions show.Sailors cavort with the animals to retrieve lost treasures.This is the COMEDY SHOW,laugh after laugh! Then we have has the ENCHANTED FOREST full of real Tropical birds.A feast for the eyes with their colourful plumage.Then the BIRDS OF PREY.this is educational as well as entertaining and you get closer than you could ever believe possible.Once seen never forgotten. Getting very popular is the 4D show with its emphasis on Environmental awareness.Featuring the monkeys throwing fruit AT YOU.Hilarious.Plus Polar bears sliding down glaciers and the sharks that swim towards you at frightening speed with their sharp teeth bared.Exciting or What! Want More! See the AQUALOCOS High Dive Show.Mad persons diving into impossibly small and shallow pools.Great Fun! This Park has it All!Because that is not all.We still have a fairground with a mini rollercoaster and great waterslides. 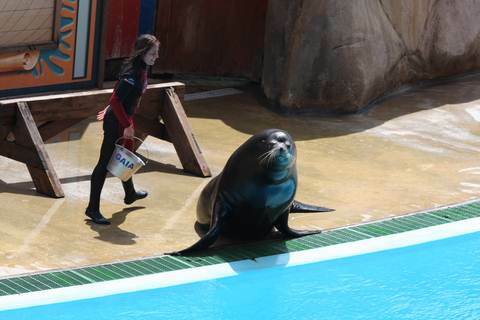 As part of their Environmental Awareness program the Park now has a Rehabilitation centre for all the poor creature that get washed up in distress on the Portuguese coastline.Which is Vast to say the least. 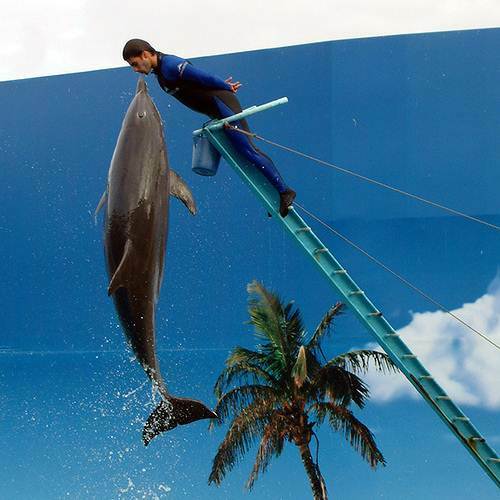 Lastly but definitely not least!Is the program of Swimming with The Dolphins.This is ZOOMARINE "coup de grace".It is expensive but a must if you can possibly do it.The benefits of this are well documented. Contact the PARK Tel 00351 289 560 300.Or Fax 00351 289 560 309. SEALIONS & PIRATES...Nearly as popular as dolphins are sealions and Zoomarine does a sealion show with pirates which is said to be hilarious.Sealions have always been none for their character and their ability to perform really amusing tricks. 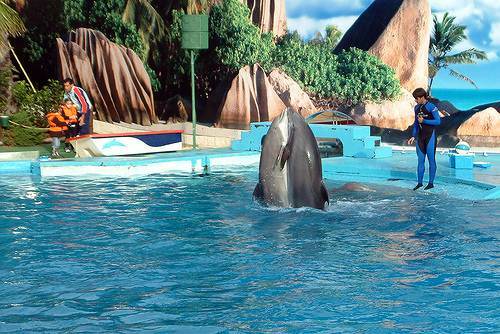 Zoomarine say on a visit you will discover the mysteries of the oceans at the best Algarve theme park you can experience. The park is located in a town called Guia just a few kilometers from Albufeira but just about anywhere you stay in the Algarve you will be able to pick up a tour which will take you to The theme park.So you do not have to restict yourself to that area. Below Zoomarine and the pirate with sealions show.I assume the pirate is going to climb the rope ladder swiftly followed by the sealion but you will have to go yourselves to find out if that is right.